Zurich, the heart of the Swiss-German architecture scene, is also home to Roger Boltshauser, the architect who has done most to advance Martin Rauch's rammed earth agenda. With their most ambitious project, the Ozeanium, ongoing, this interview with Boltshauser tracks the evolution of his earthy path. The opening of the massive Ricola warehouse provided a significant symbolic message: highlighting the potential for rammed earth beyond its traditional edge position across building culture, and also building on over a decade's worth of rammed earth groundwork in Switzerland and Austria. As those familiar with Martin Rauch's work will know, this earthworks evolution would be very different but for a meeting with a young Swiss architect, who became his key, and most long-standing architectural collaborator, and who will surely be seen to have been both significant and distinctive in his country's rammed earth history, when it comes to be written. The architect is Roger Boltshauser. Zurich born and Zurich living, the story of Boltshauser’s introduction to rammed earth is one of chance rather than design. Around the turn of 2001/2002, Rauch, and the young Boltshauser began their first, modest collaborative project, a series of sports’ field sheds. Out of that initial meeting the Boltshauser Rauch team have gone from scale to scale, and completed a suite of rammed earth projects, which have grown in complexity and technical ambition. All through this period Boltshauser’s fascination with earth as material has made itself amply clear with several further projects. Sometime between 2017 and 2019 Boltshauser’s most ambitious rammed earth project yet, an underground aquarium centre will open in Herzog & de Meuron’s home-town, Basel. The fruits of this collaboration, a half dozen or so buildings, so far, may not seem great in number, but it probably isn’t an understatement to say that the teaming up of Boltshauser and Rauch is probably the single most influential element to have propelled rammed earth, and particularly Rauch’s work, into not only the Swiss, but, arguably, the wider continental, architectural and building culture consciousness. West and downtown from Zurich’s city centre, Wiedikon is teeming with well-heeled shops and well-heeled shoppers. Like many parts of the city, Wiedikon exudes the comforts and other discreet charms of everyday bourgeois life, even though the incessant rumble of dual carriage-way and rail corridor running south out of town is a continuous humming presence. 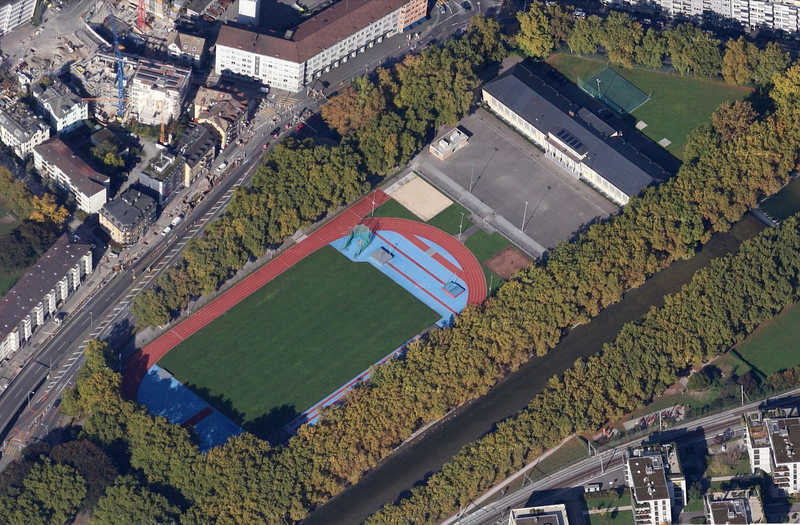 It’s close to this Wiedikon neighbourhood that Boltshauser and Rauch began their earth experiments on the Sihlholzi sports ground, an athletics track and training ground, which stands beside the citys’ technical colleges. Coincidentally (or not), it is also the address of the present Boltshauser studio office, off one of Wiedikon’s streets just a few blocks from Sihlholzi The dedicated studio building, Dubstrasse 18, inevitably highlights a further experiment with the material with which the architect has become so identified. The rammed earth wall is inside a building Boltshauser converted into his practice studio, within a residential courtyard, surrounded on all sides by five and six storey mansion housing blocks. Like many a self-designed architectural office the Dubsstrasse studio is a statement of intent and identity. Sitting two storeys high, the compact building is dwarfed by the mansion blocks and edged by their back garden walls, trees and close hanging branches. In summer time, at least, the blossoming trees reminds those arriving at the studio doors of how the courtyard remains a fully residential strip of land. Still, it’s also immediately clear, with its closely tiled brick façade surfaces and careful proportions that the building has specific aspirations. Once an artist studio, Boltshauser’s conversion underscores the immersion in materiality that characterises his practice. Inside the building this materiality is equally evident, as the first time visitor comes upon the Rauch prepared earth wall beside the staircase up to the first floor. Up the stairwell, and across the first floor entrance one of Marta Rauch’s lovely designs provide the tile for the floor counter-balancing the glass wall around the door into the upper floor studio. By comparison the storage room sheds which sit on the edges of the Sihlholzi sports circuit are showing their age, with clumps of the earth admixture falling away, and cracks and striations widening in the walls. To have uncovered a material, which bordered on the sculptural and an earthen builder, who approached his work in an alchemical manner similar to Beuys’ seems to have made quite an impression on Boltshauser. The three Sihlholzi sheds consumed much of 2001 and 2002, when Boltshauser was already 36/37. Working closely the two men bonded, and Boltshauser became Rauch’s architectural collaborator of choice, and also, increasingly, a signed up member of Rauch’s extended family. Rauch went on to ask Boltshauser to be the architect for an intensely personal project, the Rauch’s family house. While Boltshauser pursued more conventional commissions in and around Zurich, a significant slice of the next years were taken up with work on Haus Rauch, which today sits on the Rauch farm hillside on the edge of the village of Schlins, itself at the far interior end of Vorarlberg’s Rheintal valley. Asked about the extent of the influence of the Vorarlberg architectural scene, the tall, forceful Swiss architect, dressed in the semi-mandatory all-black uniform smiles a cheery small smile and suggests that the resulting building doesn’t have “that strong relation to Vorarlberg.” At the time he was teaching at Graubünden’s Technical College in Chur, and Haus Rauch owes more to Graubünden architects and engineers: Jurg Conzett, JuenglingHagmann, Peter Zumthor and Maurus Frei, than to the architects of the Vorarlberg scene. By claiming yet another explicit connection between Vorarlberg and Graubünden Boltshauser adds yet another thread between the two regions. This said, as Boltshauser remarks, the thinking of Haus Rauch “is very ecological,” a Vorarlberg rather than Graubünden trait. Yet within a few breaths he is talking of the craft and the timber construction that is at the heart of the design of the home, shared characteristics of both Graubünden, and also, Vorarlberg. Haus Rauch really is an inside story. Of the many building experiments to emerge from Vorarlberg, the Rauch home is one of the most compelling and beautiful. “It was very, very radical in a way – everything we could do was in clay. People had never built before in such a structural way, with handwork.” Although the external façade highlights the rammed earth, it is the interior where the spaces and the materials come into their own. Haus Rauch went on to win a swathe of awards in Vorarlberg and further afield, many highlighting its sustainability. It also laid the ground for Rauch’s subsequent work and direction. “It was very important for the Ricola project,” Boltshauser notes. Not only this, but Haus Rauch has the sort of reputation that has turned it into a temple of sorts for architects and others who are on the path of the future with earth building. The differences and pressures haven’t meant the end of collaboration. During the turn of the decade, a period from 2008 through to 2012, Boltshauser and Rauch’s LehmTonErde studio worked on a series of kindergarten extensions, specifically, Gonhard and Allanmoos schools, respectively, in the Swiss town of Aarau and in Zurich. Both use earth as a starting point for experiments; the Allenmoos II pavilion is more extensive, providing a series of loggia columns for a covered outdoor corridor running alongside the school building proper. The sizeable columns are complemented by clinker Petersen bricks, while internal walls are finished in earth plaster, and floors are finished with Marta Rauch's decorative tiling. Completed in 2012, two years after the Gonhard school pavilions, Allenmoos II’s earth and brick renovation earned the building a Swiss Minergie energy accreditation. In the way Boltshauser talks about his projects the ecological dimension seems always to have been central, and adds a broader lens to his discourse. “Talking about beauty isn’t enough. Beauty helps me do what I want to, to realise fantastic works that are maybe more experience. I also want to be ecological – it’s important in our society. But I don’t want to show how people how to be ecological. It should just be just beautiful.” Others have treated Boltshauser’s environmental convictions with a degree of scepticism, and certainly some view Boltshauser’s absorption in earth materials as formalist, rather than a concern grounded in deeper convictions. The physical presence and strength of what can be done with a simple and restrained palette of materials repeatedly plays itself out in Boltshauser projects, and in places materiality and ecology are overlaid, but in others the connection is less clear. and David Chipperfield. “It was the single biggest competition we have won up to now and it was with this rammed earth idea.” The Ozeanium, Boltshauser says, is a mixed building, beginning with brick before coming to the rammed earth. “It is the same idea as Herzog & de Meuron’s’ Ricola warehouse, around a concrete structure. The structured landscape moves from the brick to earth below ground.” At ground level is the entrance of the zoo: “We will bring the zoo to this building.” Between 100m and 500m underground are the sea aquariums, including what Boltshauser calls ‘a sea cliff.’ A mixture of concrete and earth, the interior exhibition wall facades are rammed earth – for people to meet a rammed earth building. The aquarium maintains the mean temperature, and the earth walls help meet Swiss regulations for humidity levels. The walls need to be very strong, separate from the pump machinery moving water round the aquariums. 25% of the building’s energy is used on pumping this water round the buildings. “It is a new way – more high tech,” Boltshauser continues. “It will be a revolution. You know, Ricola is simpler. We will dig down into the city centre.” 2019, the scheduled completion date, is several years away and there appear to be many technical challenges ahead, but when the time comes, this new high profile rammed earth building will once again bring this singular collaborative project, the Austrian earth builder and the Swiss architect, into the limelight, adding yet another chapter to the story they have so critically contributed to; - the emergence of rammed earth into contemporary building culture.